Jade Gresham finished equal 6th in the 2016 NAB AFL Rising Star Award. Mid was my main position growing up, so I just need to build my tank up and hopefully get a crack in the mid next year. Emerging Saint Jade Gresham is eyeing more time in the midfield next season, but he knows he must put some money in the bank during the pre-season to ensure he can run out games as a midfielder. The 19-year-old produced an impressive debut season in 2016, playing all but four games to become a permanent fixture in St Kilda’s best 22. 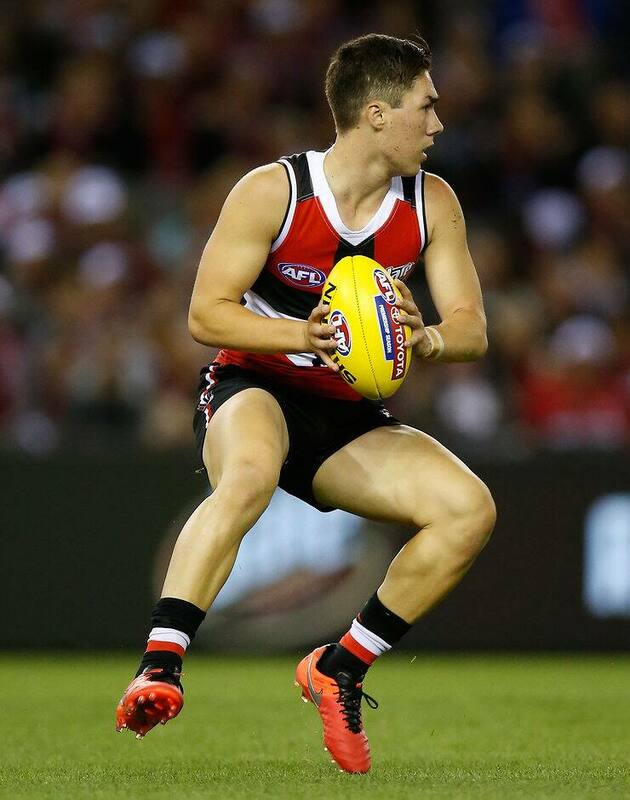 Despite starring as an onballer during his underage career, St Kilda's new No. 4 has been forced to begin his AFL career as a small forward due to the Saints’ midfield depth. Gresham, who recently inked a two-year contract extension, was exposed to increased midfield minutes as the season progressed and is hopeful of more time in the engine room in 2017. “I’ll hopefully play a bit more mid next year,” Gresham told Croc Media on Wednesday night. “Mid was my main position growing up, so I just need to build my tank up and hopefully get a crack in the mid next year. Gresham admits the rise of the Western Bulldogs has inspired the Saints to aim high next season, with a return to September for the first time since 2011 in the club's sights, following a 12-win campaign. “They’ve [Western Bulldogs] inspired us a little bit; they’ve got a young side and so do we,” he said. “We went alright this year, dropped a few games we should have won but I reckon next year hopefully we can take a step forward and make finals, that’s our aim really. St Kilda key forward Paddy McCartin is progressing well after overcoming a broken collarbone which brought his frustrating season to a premature end in Round 22. Gresham said the 2014 No. 1 pick has been one of the standouts on the training track across the first six weeks of the pre-season program. “He’s going really well; he’s a lot fitter and stronger; he’s tearing training apart,” he said.